Many people have a collection of doorway images. These could be images from a holiday or even some zany colorful door you have found in your neighborhood. This class will give you a technique to recreate those doorway images in fabric. Start with the pattern provided; then, after working through the process, you will be equipped to make some of your own designs. These make wonderful gifts, but be careful: I became addicted to making small doorway quilts. 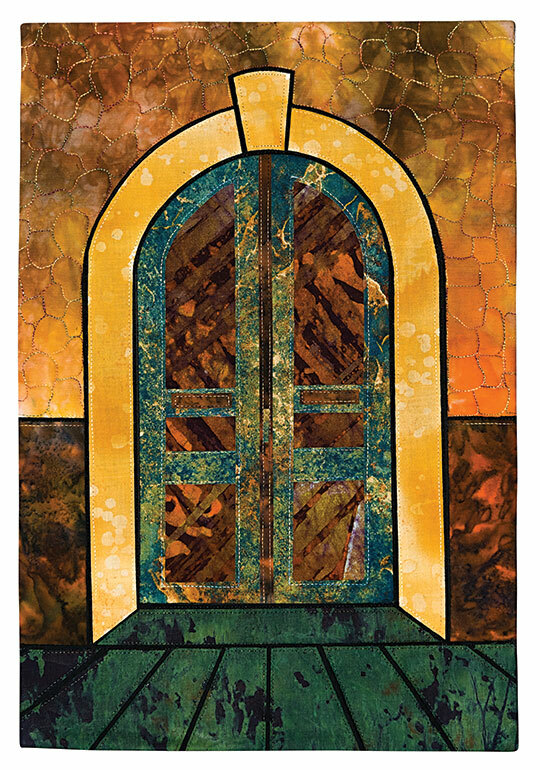 The small doorway project will be constructed with the possibility of the quilting and edges to be completed after class. This can be taught as a one-day class when everyone uses the pattern. Alternatively, it could be taught as two 3-hour sessions. Each student needs a clear area to work. Encourage students to not set up their sewing machines before class so that they have a good working space. Photocopy the pattern to the correct size, one copy for each student (pattern on p. 104). I would also encourage the teacher to make a sample, working through the process before class. 1. Work through the steps outlined in the book, beginning with the preparation section. This will include tracing the pattern onto tracing paper and preparing the freezer paper patterns. 2. Follow the directions for construction, which include preparing the bases in the dark fabric, making the walls, making the door, making the arch, and constructing the foreground. 3. Stitch around each segment. Encourage students to use the correct size needle for their thread (see p. 50). 4. The next step, trimming, is very important, and it should be highlighted to students that this only occurs at this stage, not earlier in the process. Before the edges are trimmed back, remind students that they need to be stabilized with the addition of a strip of Lite Steam-a-Seam 2 on the back before cutting. 5. Finally, it is time to put it together. After making an appropriately sized sandwich, mark the correct placement of the tracing paper pattern on the batting (p. 103). 6. Follow the steps to overlay the segments in order.